Our mission at the GRPC Juniors program is to teach children ages 10-18, gun safety and life's skills through the discipline of competitive rifle sports. 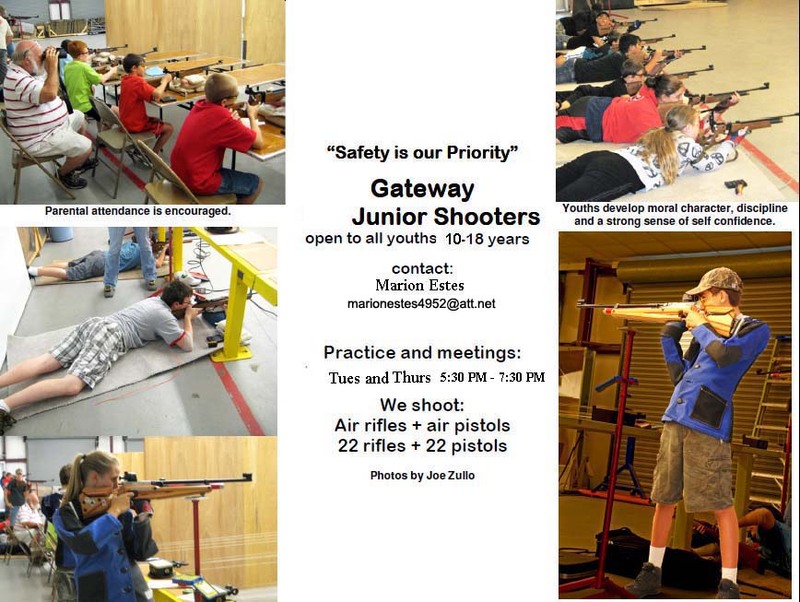 Our Junior program is one of the most successful junior shooting programs in the country. Our program is open to any junior aged 10-18. We normally hold open practices Tuesday and Thursday evenings from 5:30 PM until 7:30 PM. Please arrive between 5:00 PM and 5:15 PM to set up equipment for a prompt start of shooting at 5:30 PM. Parents please be back before 7:30 to pick up your youngsters. Most major holidays are observed. GRPC sponsors the GJS, Gateway Junior Shooters, by providing an indoor air rifle range, rifles, pellets, targets and associated gear. The GJS adults provide coaching, instruction, advice and safety considerations. We offer instruction to youths between the ages of 10 and 18. Physical size and maturity are factors in entering the program. Safety is paramount. All persons entering the program are required to have a safety/procedure/process briefing, and pass a written Air Rifle Safety Test. If the only thing we instill in youth is safe gun handling, respect for the use and care of guns, then we have achieved a major goal. We meet two nights per week, Tuesdays and Thursdays, from approximately 5:30 PM to 7:30 PM. The cost is $11 per student for the first quarter year, then $10 per student per additional quarter. Shooting is done at the International Shooting Union (ISU) distance of 10 meters. The rifles are compressed air pellet rifles, capable of superb accuracy. We teach the European School of 3 Position Rifle, simply because the Euros have led the pack for the last 40 years or so. The positions are: Prone with sling, Offhand (standing) and Kneeling with sling. The instruction is person-based, since learning curves vary from one person to the next. All advances are made based on performance, so there is no “falling behind” if the child misses some events. Competitions (matches) are held. We do not want to be thought of as a competition mill, but most kids enjoy the challenge. Participation is not required. We have had kids go to the Junior Olympics, and some have gained partial/full scholarships, including West Point, US Naval Academy, University of Nebraska and a few smaller colleges. Shooting is a lifetime skill/sport, where size, strength and speed are not considerations. Shooting is about 85% mental. The rest is the quality of the gear used. Much like golf, but not as much walking.